From Canazei, do not continue towards Alba, but take a left and climb steeply along the road that connects to Val Gardena. Shortly after a ski area, the road forks, take the road that goes right and follow this via many hair pin curves to the pass Passo Pardoi (2239m). Park on the right hand side of the road, where there is a good sized parking lot. 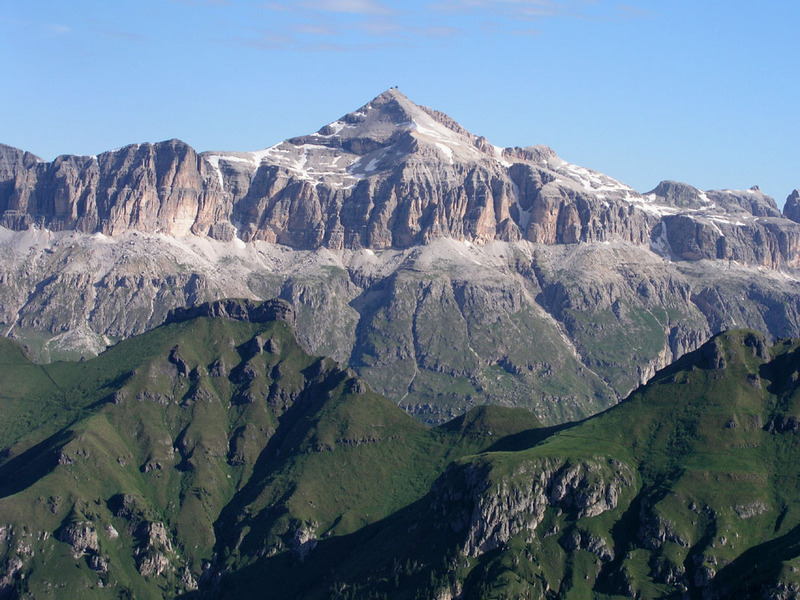 Route description: Take the gondola lift from Paso de Pordoi to Sass Pordoi (2950 m). In March 2003, this ticket was 10 Euro. From here, descend along a marked ski track to Rifugio Forcella Pordoi (2829 m, closed). Continue a traverse east followed by a gentle uphill until you are on a more level plateau. The summit is straight ahead and there is a hut on the very summit, called Capanna Piz Fassa (closed). The trail heads up the south-west ridge, it is well marked and quite easy, even in winter conditions. Crampons and an ice axe was worth to take along, but not absolutely needed. The difficulty never exceeded YDS class 2+, there may be an even easier route that keeps the difficulty at 2, but since I was short of time I took a very direct approach. The summit has a hut, a big antenna, a metal cross and a small christian statue. The view across to Marmolada is good, while the view towards the impressive cliff walls of Langkofel (3181m) and Plattkofel (2958m), actually what is seen is likely Zahnkofel Dente (3000m) and SassDadumann (3114m) southern parts of the former named peaks. Return the same route. Comments: This hike turned out quite differently than planned. It was already getting late in the day, I had lectured in Trento, driven a bit convoluted up the valley, explored a good place to start an attempt on Marmolada (3343m). When I finally parked at Passo Pordoi (2239m), the time was already 1500. I had a dinner appointment in Trento at 1930 that I intended to keep, but with about two hours of driving back there should be no problem. The sign said that the gondola ran every 10 minutes, I bought a roundtrip ticket for 10 Euro and waited about 15 minutes before leaving. Arrival on the top of the gondola closer to 1525. A sign informed that the last return gondola would leave at 1630. The summit looked within reach, I set off with the idea to check my progress at 1600. First, descending more than 100 vertical meters, then hiking along and gaining elevation. At 1600, I was very close, but not quite on top. Lungs and heart pumping quite hard, fast uphill walk with crampons at 3100 meter, I felt it. Finally, on the summit, the time was 1605, I needed a short break and took some pictures (3 minute break). Then a careful, but fast return down the ridge. Almost down and still 13 minutes to go. I ran along the easier sections and reached the Refugio at the lowest saddle with only 5 minutes left. More than 100 vertical meters, quite steep. I decided to try a slightly steeper, but more direct line than on descent in order to save a few minutes, mistake! The snow was too soft, I sank in. Traverse back to the skislope, I realized that I would just miss the return time, well I could always hike down, perhaps the last departure would be a little late (just as my trip going up?). I reached the top station, it looked empty. I took off my crampons in order not to damage the wooden deck. Suddenly, a man (gondola operator) appeared. He announced that I was late and that the last run of the day had left. I asked if there would be a last (unofficial) run, assuming he would not spend the night up here. He just repeated that I missed the last departure. I said that I could hike down if needed (never mind most likely 30 minutes), the guy nodded his head and said yes, this is what I should do. The time was about 1645 by now, I attached my crampons again and started walking back towards the saddle that I just had struggled up from. I noticed the gondola lift starting, and just as I had tought, there travelled the gondola operator down. A guy with no sense of service, I said to myself, after all, I had purchased a round trip ticket, the gondola can easily carry 25 people, why not be a little friendly and helpful. F... him, I can hike down, no problem..
After reaching the Rifugio, I headed down the impressive "cut in the cliff" called Forcella Pordoi, steep, buy easy, many downhill ski tracks. Further down, a first problem occured, the snow did not support me, I fell through, deeply, all the way to my hip. Bad news, I said, double F... these gondola operators.. Now, what about route finding? There was no obvious way, most ski tracks seemed to bear left. I ended up following some foot prints, partly avoiding the deep snow struggle. Under these conditions I realized that the hike down could be longer than first thought. Well, the foot prints went into an ugly looking very narrow gully with moderately steep snow in the bottom. Was this the secret way down for non skiers? The gully made a right bend further down so no way to see what would come. I took the chance and started down. Bad news!, about 100 meter down and the gully ended in a 50 meter vertical cliff. A climbing route with a fixed rope continued down around a corner. My harness was in the car trunk, this was NOT intended as a climbing trip. No way, I could or should try this. Climb back up, more bad words about this gondola driver. Back up, continue to traverse left. This looks worse than ever anticipated, there seems to be a continuous 100 meter vertical cliff band all the way. A new snow gully is looked at, no this looks bad. Further on, a third, steep gully. There is no way to see how it ends, I decide pretty strongly against it, and have to climb higher in order to circumvent it. It will be dark in another hour, I realize that unless I find a way down, I will just have to bivu until tomorrow, this is definitely NOT a place to wander around in darkness. The slope is moderately steep, partly snow, partly loose rock, below me are vertical cliffs. Where the heck do skiers get down? Possibly all the way in the opposite direction? (Yes indeed, this is obvious from the picture below, taken the next day from Marmolada, this was not at all obvious when looking down the slope from higher up.) Finally, a gully that seems to go quite far down without any dangerous stuff, I decide to take this one, a few foot prints are also encouraging. The snow ends and the cliff drops off, how steep? How far down? I look over the edge and see a crack that looks climbable. Down further, there is now only 10 meters down, I decide that this is it. 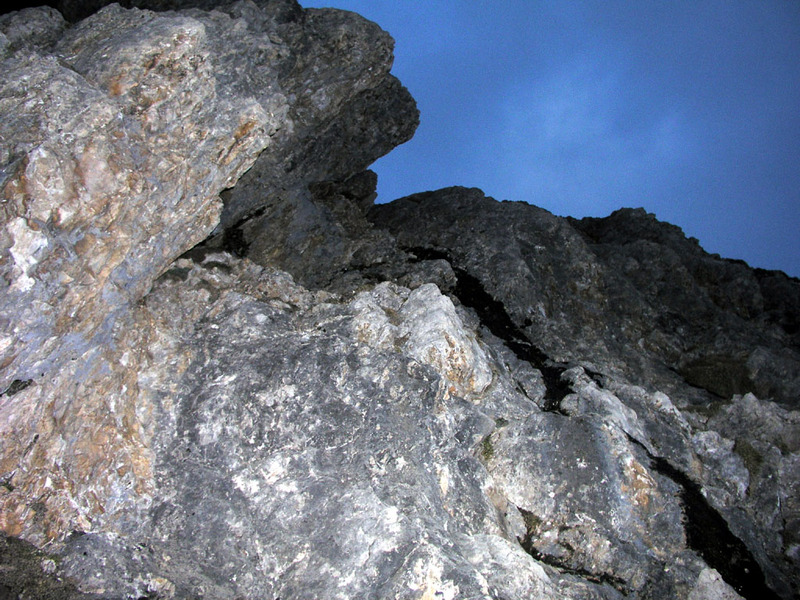 The route turns into YDS class 4 climbing, but it is protected, the crack can be used effectively, there is snow below. I get down without any great difficulty, but with lots of determinism. In conclusion: One hour roundtrip to this peak may be less than reasonable unless you are a bit in better shape than me. Piz Boè, from Marmolada on July 17. 2004. Piz Boè, this picture shows the two ways down that I failed to see. My first gully is a hidden "crack" close to the beginning of the cliffs that continue to the right, there is a triangular shaped rock area above it. I climbed down at the right side of the first V-shaped snow area that can be seen in the upper part of the cliff band. The crux of my down climb.